Adair native Whitney Graves was crowned Ms. Tennessee United States 2018 on April 21 at the Country Tonite Theater in Pigeon Forge, TN. Whitney resides in Murfreesboro, TN, but she says she tells everyone that she is an Adair Countian when asked about her hometown. Whitney won Ms. Tennessee United States after deciding to get back into the pageant circuit following an eight-year break. As a Ms. United States winner, Whitney will have unique speaking opportunities during her yearlong reign as Ms. Tennessee. On top of speaking events, Whitney will go on to represent the state of Tennessee when she competes for Ms. United States 2018 in July in Orlando, FL. Whitney says that she is most excited about getting to meet and connect with more people over the next year. Whitney would like to thank all of her Adair County friends and family for their support and all the kind messages she’s received since being crowned. If you would like to follow Whitney’s journey or support her, visit facebook.com/whitneyterrellgraves for more details. 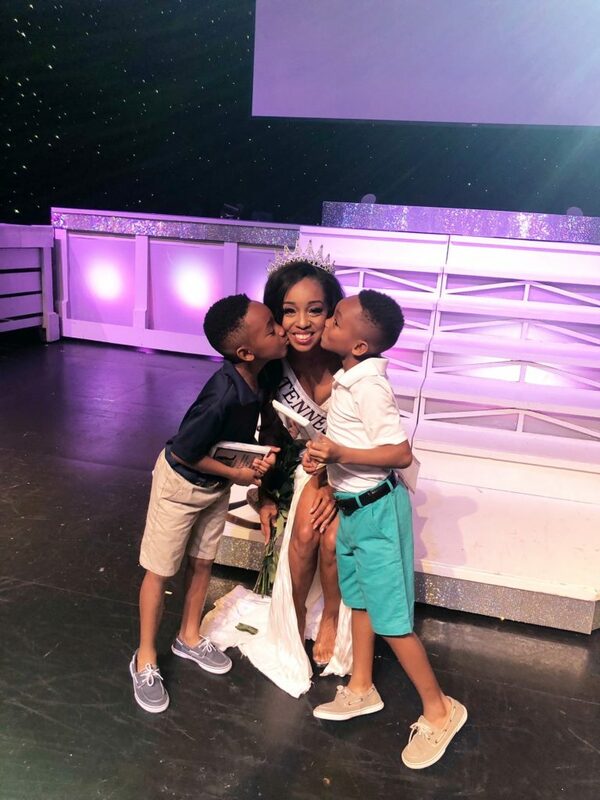 Adair native Whitney Graves receives congratulatory kisses from her sons Bryce and Brayden after being crowned as 2018 Ms. Tennessee United States.